I know I just came back from vacation, but I am seriously dying for this 3-day weekend approaching. Mostly because I could really just use some time to relax and hang at home. Sure, this will be a dessert filled weekend, but sleeping in, is a must. Although, if any of my blogging friends want to go back to Miami, I am also totally on board! 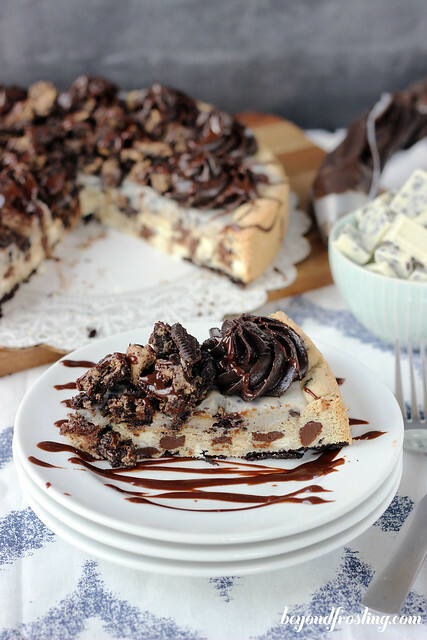 I can’t wait to tell you about this Cookie and Cream Cookie Cake. One of the reasons I am so obsessed with this cake is because it uses a pudding mix in place of some of the flour. This helps keep this cake UBER soft. It’s pretty much the best thing to happen to cookie cakes since sprinkles. Knowing that there are so many flavor combinations, I am kind of dying to make more cookie cakes. I wanted to go all cookies and cream out on this cake. 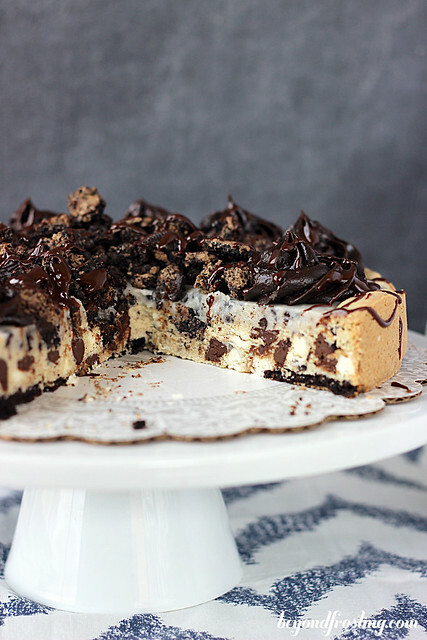 So I layered the bottom with Oreos. It will only work if you line the bottom with parchment paper, large enough that it actually hangs over the edges of the spring form pan once it is locked into place. Otherwise your Oreos will be left on the bottom of the pan. The top of this cake is a party in and of itself. 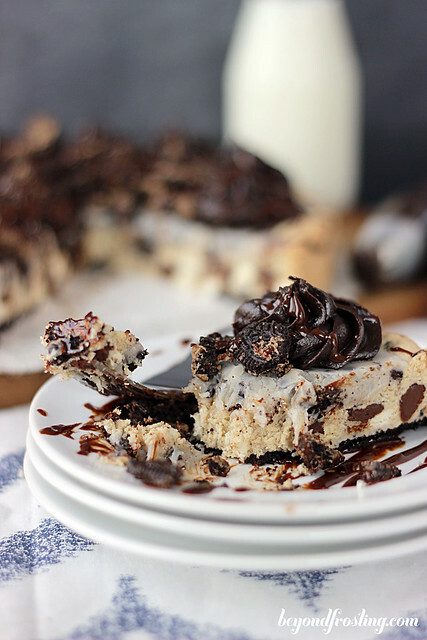 It has a layer of cookies and cream ganache, which is melted Hershey’s chocolate candy. Then it is dotted with a dark chocolate frosting, covered in more Oreos and smothered in chocolate ganache. My BFF Lindsay made a similar cake awhile back, and I have been waiting to post mine. You see the thing with us is that great minds think alike, especially when it comes to sugar! Plus, Lindsey pretty much kills it with the cookie cakes. There is something nostalgic about Oreos in any way shape or form. 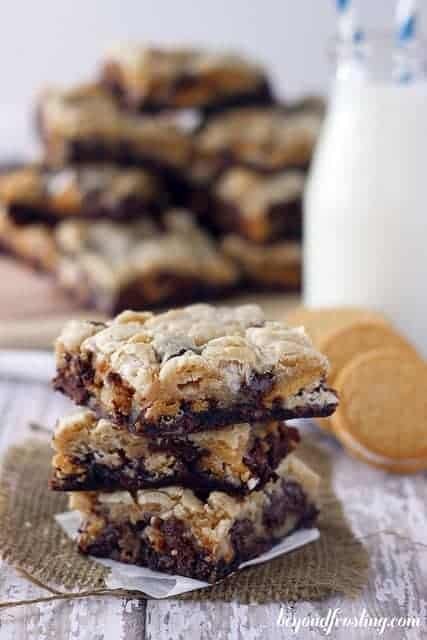 So when you combine Oreos with chocolate chip cookies, magic just happens. 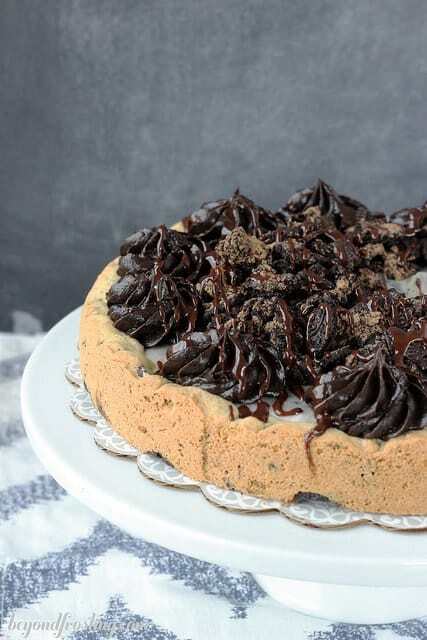 An Oreo cream cookie cake with a cookies and cream ganache and garnished with chocolate frosting, Oreos and chocolate ganache. Line a 9” spring form pan with parchment paper and securely tighten. 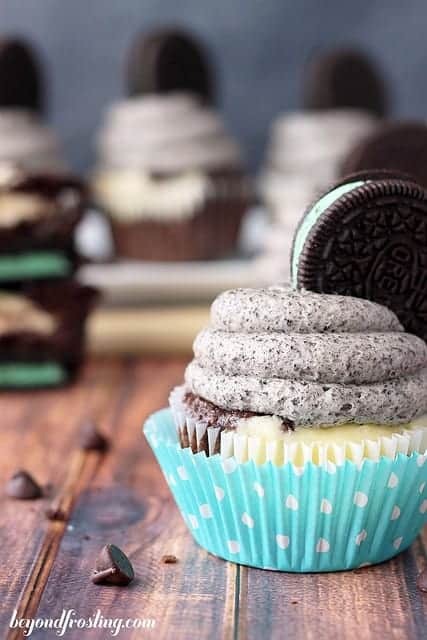 Line the pan with Oreos, packed tightly. Set aside. In your mixing bowl, combine both granulated and brown sugar together with butter. Cream together until smooth. Add eggs, one at a time, ensuring each egg is well beaten. Add vanilla extract and beat on medium speed until all ingredients are well combined. In a separate bowl, combine flour, dry pudding mix, baking soda and salt. Stir to combine. Slowly add flour mixture to batter and mix until dough forms. Add milk and white chocolate chips and fold into dough. Press dough into spring form pan. Bake at 350°F for 18-20 minutes until edges turn golden brown. Remove from oven and allow to cool completely. Combine Hershey’s Cookie and Cream chocolate with heavy whipping cream in a microwave safe bowl. Microwave on high for 60-90 seconds until chocolate is melted. Stir to ensure it is evenly melted. Pour over cooled cookie cake. To make the frosting , combine softened butter with powdered sugar and cocoa powder. Mix on low speed until mixture gets a little clumpy. Add heavy whipping cream and increase speed to medium high, and mix until smooth. For a thicker frosting, add more powdered sugar. For additional chocolate flavor, add cocoa power. Pipe frosting onto the edges of the cake. Crush remaining Oreos using a Ziploc bag and rolling pin. 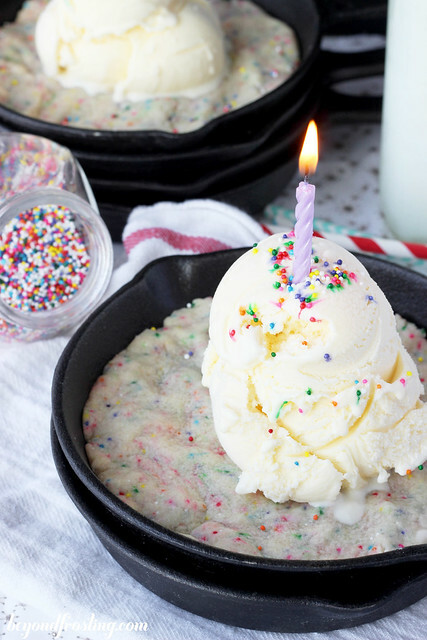 Sprinkle crushed Oreos onto of cookie cake. Combine chocolate chips and heavy whipping cream in a microwave safe bowl. Microwave for 60 seconds and stir until smooth. 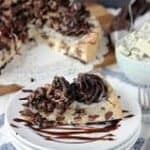 Drizzle over top of cake. So much awesomeness in one wittle cake! LOL! All I want to do is make cookie cakes now! Wow, Julianne! I am really intrigued by your pudding in the cookie cake discovery. Can’t wait to try this one and see the others you are sure to create! That said, I think I would be very happy just eating the topping with a spoon! Yes! It helps keep the cookies so soft!